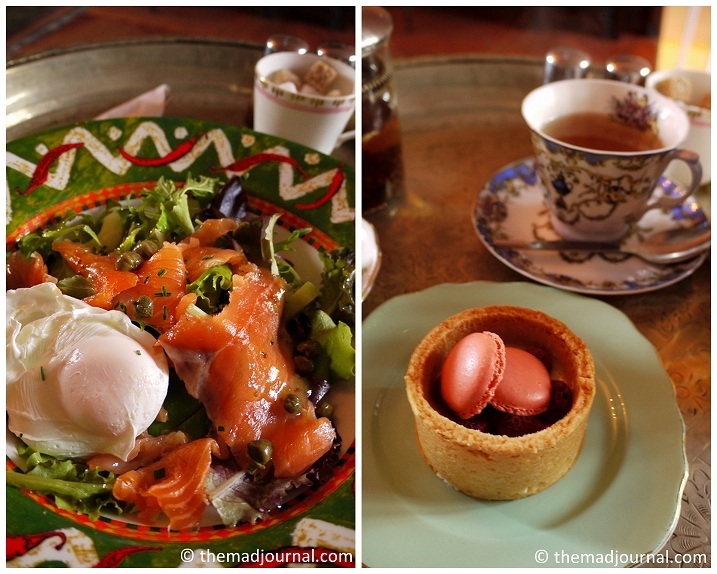 I'll write about a very girly cafe in East Dulwich. The cafe was talked about among the vintage loving girls. It's a shame East Dulwich is a bit far from my flat. It takes 15 mins by train from London Bridge. As the cafe is called "Le Chandelier", you can see a lot of chandeliers in the cafe. Sparkling chandeliers, why on earth is it so attractive to girls?? After all, women loves glittering stuff. Of course, the interior apart from the chandeliers are also beautiful. 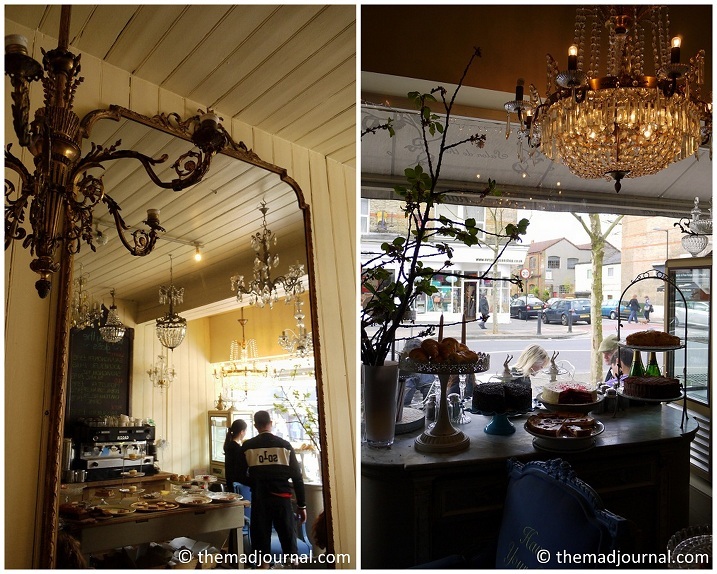 Those chandeliers suit the decorative vintage furniture. It looks like Marie-Antoinette's room! they mix the decorative vintage with Arabic interior. Arabic tea tables and mosaics matches very European vintage furniture. Our table was at 1st floor. It was an attic in the Moroccan interior. The chandeliers suit it too! It's not only the beautiful interior to catch girls' attention. There are lots of cakes by the window, and more on the table.......! but I guess it's usually full of cakes on the table ......! But still plenty of kinds of cakes. Hard to choose one! They have genuine drinks, not only sweets. They have 34 kinds of tea selected by their tea master. English black tea, herb tea, Chinese tea, Japanese tea, flowering tea, and so on. They've got Monmouth Coffee and alcohol too. This perfect cafe for girls is always packed on Saturday when the market is opened. On the ground floor, most of girls were having afternoon tea. We've got the smoke salmon salad for lunch. Their food also very good!!! I really like it so I tried to make it at home. I had the raspberry and white chocolate sauce tart? but I would love to try other cakes too!! My tea was "Blue Sapphire Earl Grey". Such a beautiful name! It suits the blue tea cup too. It was nice with a sweet cake which emphasize its refreshing aftertaste. I'm sure you can enjoy there a whole day. I highly recommend to go there on Saturday.